From our passion, determination, commitment, and a desire to never quit, IronForged Fitness was developed to help others live the healthiest life possible. Driven from a desire to never quit. No matter what life throws at us, we’re determined to reach our goals. Using healthy, science-based methods, we apply a variety of nutritional and training methods to help our clients reach their goals – whether it’s weight loss, muscle gain, or stepping on stage as a fitness competitor. If you’re looking to start your own healthy journey and aren’t sure how to get started, check out our services and let us help you reach your goals. 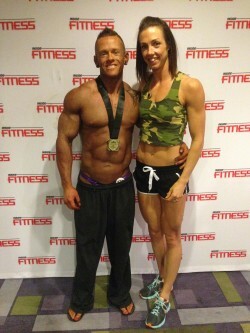 IronForged Fitness is run by Ashleigh and Kyle Atkinson. 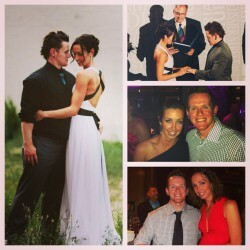 We are a married couple who share a passion for training, competing, and working with others. We believe that with hard work, anything is possible, and that’s exactly what we’re about – working hard to reach our goals and not settling for less. Ashleigh is a Health Promotion Specialist, concentrating on school health programs. She has a Bachelor’s degree in Physical Education and a Masters of Human Kinetics with a focus on Sport and Exercise Psychology. Additionally, she is a certified CanFit Pro Group Fitness Instructor, Health and Weight Loss Specialist, and Personal Trainer to further help people reach their health and fitness goals. She has been competing with the Ontario Physique Association and Canadian Bodybuilding Federation for the last 4 years, stepping on stage in the bikini, figure, and women’s physique categories. Kyle is a Graphic Designer, with a wide portfolio ranging from print work, interior design, photography, videography, and clothing designs. He’s worked for an equally wide variety of clients – government, corporate, and in the fitness industry. Over the last 4 years, Kyle has worked his way up the ranks of the Ontario Physique Association bodybuilding world, moving from the light middleweight category to light heavyweight in his most recent stage appearance. For as long as I can remember, I wanted to be involved in health and sport in some way. Being active was a major part of my life from a young age – I played baseball, basketball, and ran track, but my true passion was synchronized skating. Before graduating high school, I had competed regionally, nationally, and internationally representing Team Canada. I guess competition has always been in my blood! We trained hard and often – at least 5 times a week, often in the early morning when no one else wanted ice time. I was fortunate enough to continue skating through my undergrad, as my school had a varsity team and there was a competitive adult synchro team in the area, but when I moved cities for my Masters, I hung up my skates. At this point, I got hooked on group fitness classes, and with some encouraging I became an instructor. This fulfilled the void of skating, allowing me to be active and “on stage” – it was a natural fit. I’m touched when people tell me their personal stories, and love watching everyone reach new levels of health and achieve their goals. In 2013 my focus shifted again, driven by the desire to push myself physically. The notion of doing a fitness competition had always been in my mind since I started reading Oxygen magazine and their show coverage section. In my first year of competing, I stepped on stage five times as a bikini athlete. It was a great introduction to the stage and the life of a competitor, by my ideal physique took me out of the bikini category pretty quickly. I’m currently competing as a physique athlete, with the goal to continue growing within this division. 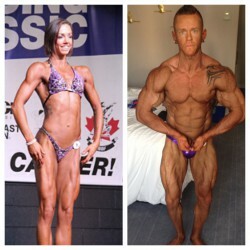 Kyle and I do all our training together and I love training like a bodybuilder! My passion for health and fitness extends to the desire to help others reach their goals. Through my career, I know too well how quickly our rates of overweight and obesity are rising, and how these factors impact every aspect of your life from your mental health, to sleep, and increasing your risk of other chronic diseases. I also know how confusing nutrition and physical activity can be! During my studies as a Masters student, I gained about 20 lbs of unwanted weight through poor nutrition and drinking. I fell into the trap of assuming the cardio I was doing allowed me to eat whatever I wanted. The weight came on quickly. I did my research and made the lifestyle changes to lose it and keep it off, learning more about training and nutrition along the way. I put a big focus in credible information sources, doing research daily on new nutrition and training protocols to help educate and maximize client’s progress. I was always very active growing up. I played numerous competitive sports, hockey and baseball being my main focus. In the winter I would be on the ice 5 days a week, and the summer was no different for baseball. I always found comfort in a competitive environment, that drive to push myself harder than last time, to be better than before, to never settle for anything less than what I set out to achieve. However, even being as active as I was, I was also an overweight kid. I was out-eating my activity level with unhealthy food choices. I lived in this pattern until I was about 13 or 14 years of age, when one day I woke up and a switch went off in my head that I was going to change my life. What made this switch go off? It was probably a combination of not being happy with how I looked and being teased about my weight. Either way, I made the decision to change and that’s the first step for anyone, they have to decide they want to change for themselves. That marked the first day of my fitness journey. I cut out junk food, altered my portion sizes, got a gym membership, and spent a lot of time running and biking. It wasn’t easy at first – it was hard to watch people around me eating pizza and all the other things I loved – but I had made a commitment and quitting wasn’t an option. Within 6 months of making the decision to change, I had lost 55lbs, all before my 15th birthday, without any outside help. Watching the progress – the number on the scale go down, as my strength and endurance improved, kept me on this path for the next 14 years and so was born my passion for fitness, training, and nutrition. Knowing how great it feels to reach a personal goal and then set newer and tougher goals has led me to want to share my training and nutrition knowledge with others. I want to help them reach their own goals and show them that living a healthy lifestyle doesn’t have to be as difficult as it may seem. I love your blog! Lots of great fitness and nutrition tips! I have participated in a few of your step classes at goodlife devonshire. You are a great instructor and really motivate the class. I have fallen into one of your “fitness myths!” I do cardio all the time and I would say 95% of my workouts are cardio. I think this is because I only do all the classes at goodlife for my workouts. I do body attack, CX, shred, rpm, pump etc. However, I am no longer seeing any changes in myself. I work really hard in the classes. I push myself and I even increase my weights in pump. I am thinking of starting to do some free weight/machine exercises on my own but I have no idea where to start- especially as a female (I find that some stuff male trainers have shown me in the past isn’t working for me). If you have any suggestions on what I can do to improve my strength and gain muscle tone I would greatly appreciate it!! Thanks for the kind words!!! I miss teaching the Devonshire group – I never seem to get over there anymore!